At Pilates Connection, we’re constantly asked by our members about the magic recipe for a good night’s sleep. There are many factors that contribute to this – including your mattress, bedding, environment, diet, health, and the position you sleep in. While we can’t cover all of these in one article, we thought we’d focus on sleeping positions, as there is some research behind this topic. Depending on your individual circumstances and health, you may find that some positions are better for your body, and will help you wake up in the morning with fewer aches and pains. This article below was originally published by Hello, a company dedicated to inventing and building products to help enhance people’s lives. Enjoy the read (and we hope to see you all well rested and full of energy after a great night’s sleep!) …. We all have a preferred sleeping position, whether it’s on our sides, our backs, or on a specific side of the bed. It turns out that there’s actually some scientific research behind sleeping positions, and how they can affect our health. Which sleep position is actually best? According to National Sleep Foundation, there are four main sleep positions: back, stomach, side, and in a fetal position (which is essentially a variation of side sleeping). Sleep experts generally think sleeping on your side is the best, but there are many variations. When you do sleep on your side, it’s best to place a pillow between your knees and keep your knees slightly bent, which “keeps the pelvis in a straight line and prevents unnatural twisting, according to Business Insider. Side sleeping is the most common, according to The Wall Street Journal. More than half of people, about 57%, start their nights sleeping on their sides, 17% fall asleep on their backs, and 11% sleep on their stomachs, while the remainder vary their sleep positions throughout the night. 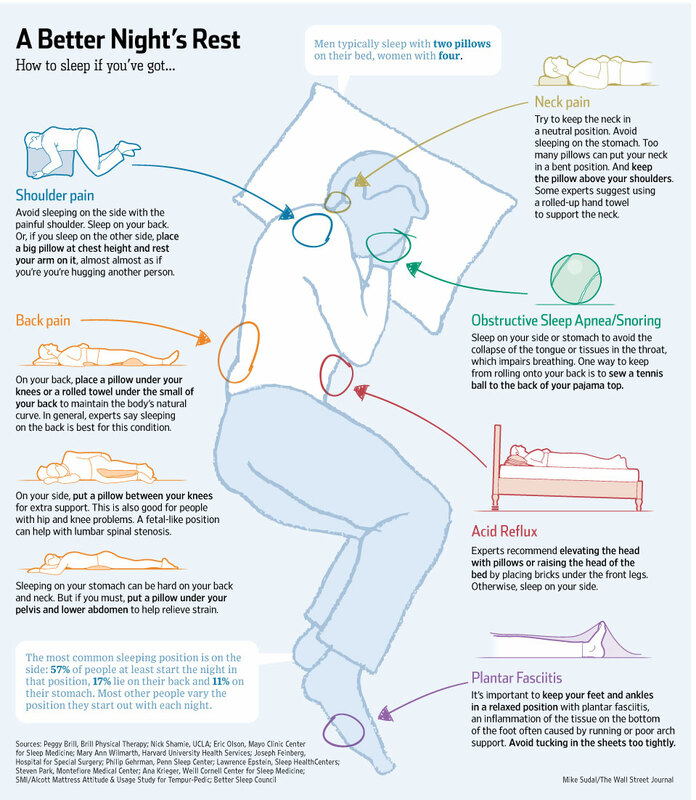 How does your sleep position affect your health? Sleeping on your back can potentially cause back pain, so placing a pillow under your knees to create a more natural spinal curve might be a good idea. Generally, the least recommended position is sleeping on your stomach, since it can cause lower back or neck pain. According to The Wall Street Journal, there can be benefits to other sleeping positions as well: Sleeping on your back with your head and neck elevated can help you deal with acid reflux, while sleeping on your side can help with both sleep apnea and snoring. How does your sleep position affect your brain? Research from Stony Brook University looked at the potential effects of sleep positions on brain waste. Scientists recently discovered that a toxic protein called beta-amyloid is removed from the brain while we sleep, according to the NIH. This is important because this specific toxin is known for building up in the brains of people with Alzheimer’s. The Stony Brook researchers found that sleeping in a lateral position (on your side, ideally with a pillow between the legs, and under the middle section of the back) was best for effectively removing brain waste, which naturally builds up as we sleep. So, how should you sleep? While there are benefits to different positions, It’s impossible to tell exactly what might work best for you without considering other conditions. So go with what feels right based on which areas of your body are more likely to cause you pain (if it’s your hip, for example, sleep on your side). In addition, if you suffer from digestive issues like heartburn, studies found that sleeping on the left side reduced heartburn while sleeping on the right side increased it. If you’re struggling to decide which sleep position is best for you, or have a more serious medical condition that should be considered, talk to your doctor to see if you should switch it up for a good night’s sleep and better overall health. sleep and tagged back sleeping, good sleep, healthy sleep, side sleeping, sleep guide, sleep position, sleeping positions on August 25, 2017 by Pilates Connection.